The Broda Pedal Chair is ergonomically designed to encourage self-mobility. It’s an excellent option for residents who can self propel within a facility and allows a proper foot on floor position. 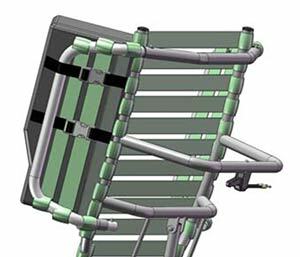 The Pedal Chair is a comfortable, safe, and stable alternative to an indoor wheelchair. With up to 18° of infinitely adjustable seat tilt, the Pedal Chair aids in preventing residents who foot propel from pulling themselves off the seat without the use of restraints. 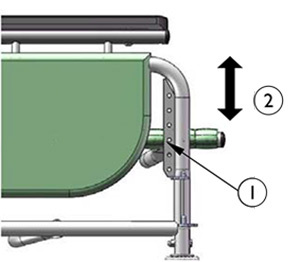 The tilt-in-space design allows infinite positioning in a constant amount of space, preventing slumping and sliding without use of restraints. 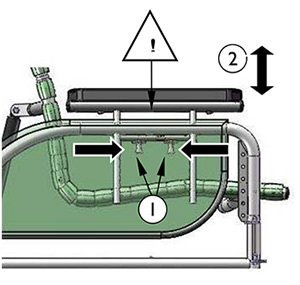 Gas cylinders allow the seat to be tilted to any position from most upright to the lowest within its range. 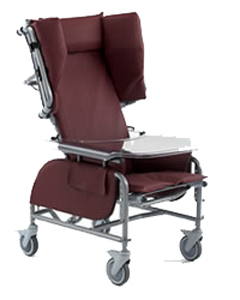 Use seat tilt to safely position the resident, redistribute pressure and increase comfort. Place your right hand on the bar to assist movement and squeeze the tilt handle with your left hand. Raise or lower the seat tilt until the desired angle is achieved. Wings support the Shoulder Bolsters which provide upper body lateral support to the resident. Depress the top button (1) and pull the wing from the receptacle. The wing may be moved out of the way without its full removal. To completely remove the wing, depress the bottom button (2) and remove from the receptacle. Insert the lower end of the wing into the lower receptacle.. Then insert the upper end into the upper receptacle. Ensure the wing is secured in place. The Shoulder Bolsters provide upper torso support, protection and containment and accommodate asymmetries in the chair user. Their unique design allows for proper elbow access to the arm rest. The Shoulder Bolster is always used in conjunction with the side wing. 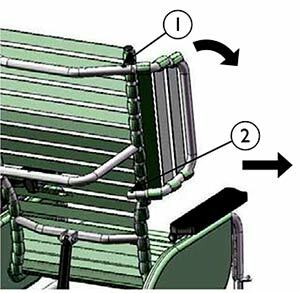 -Feed both Shoulder Bolster straps between the inner strap of the wing and the frame of the chair. Secure the buckles and cinch the straps to secure the bolster to the wing. The bolster can be slid up and down the wing if desired. Note: The Shoulder Bolster can be inverted on the wing in order to provide support to narrower residents. 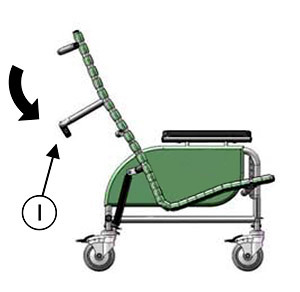 The seat to floor height is adjustable to allow for proper “foot on floor” position for foot propulsion. Using 7/16 wrenches, remove the bolts. Raise or lower the front of the seat to correspond with the holes at the desired seat height. Changing the seat height on the Pedal Chair may affect the range of seat tilt as only the front of the seat is being raised. 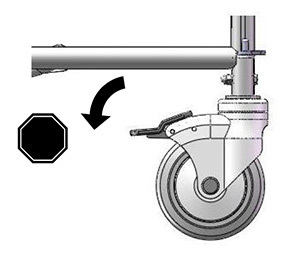 If desired, a PAB Length Adjustment Bar may be used on the tilt cylinder to maintain the original range of tilt. The PAB BAR may be used to maintain the original range of tilt when the seat height has been adjusted. -Remove the bolts and spacers from the top of the cylinder. Slide the PAB Bar over top of the cylinder. Determine the height for the PAB BAR and insert a 2 ¼” bolt through the appropriate hole. After inserting the bolt, place 2 spacers- (1/2” and 3/8”) before inserting the bolt through the cylinder. Insert the bolt through the cylinder and secure. Attach the top portion of the PAB BAR to the chair back. The armrest height can easily be adjusted in order to accommodate various residents. 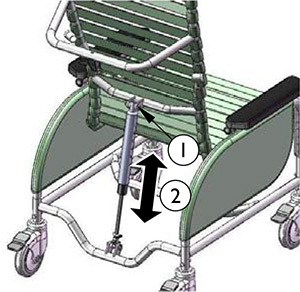 The armrest height should be adjusted to provide correct arm support for the resident as determined by the caregiver. Squeeze the pins together which are located under the armrest flap. WARNING: DO NOT place fingers at the top of the pins as this could cause pinching. Place fingers in the concave shape of the pins. Raise or lower the arm to the desired height. WARNING: DO NOT place fingers anywhere underneath the arm while adjusting, as this could cause pinching. Upon releasing the pins the armrest height will lock into place. Secure the outside flap on the side panel. Change the height on the other arm as desired. The Pedal chair features 5” total lock front casters and 5” fixed rear casters. Step on/off caster pedal to lock/unlock caster. Always ensure the brakes are not locked when wheeling the chair. For chairs with mag wheels, lock and unlock using the handbrake. seat height: adjustable from 12.5" to 17.5"
seat width: 16", 22", 24", 26", or 28"
seat depth: 15.5", 18.5", or 20"
back length: 33.5", 35", 36", 38", or 40"